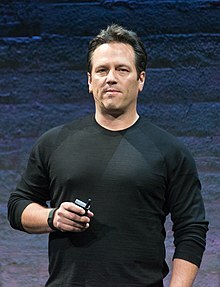 Phil Spencer (born January 12, 1968) is an American business executive, who is the current executive vice-president of Gaming at Microsoft. He is currently the head of the Xbox brand and leads the global creative and engineering teams responsible for gaming at Microsoft. Spencer earned a bachelor's degree from the University of Washington and currently serves on the boards of the First Tee of Greater Seattle and the Entertainment Software Association. Spencer served as general manager of Microsoft Game Studios EMEA, working with Microsoft's European developers and studios such as Lionhead Studios and Rare until 2008, when he became the general manager of Microsoft Studios, eventually becoming the studio's corporate vice president a year later. He has participated in Microsoft's E3 conferences since 2010. In late March 2014, Satya Nadella announced in a corporate e-mail that Spencer was to "lead the Xbox, Xbox Live, Groove Music and Movies & TV teams, and Microsoft Studios". In September 2017, Spencer was promoted to the Senior Leadership Team, gaining the title of Executive Vice President of Gaming within the company. He reports directly to CEO Satya Nadella. In 2018, Spencer delivered the keynote address at the 2018 DICE Summit. Spencer spoke at the 2018 Game Awards. ^ Ekberg, Brian (11 December 2017). "Introducing Forza Motorsport 7's December Bounty Hunter: Phil Spencer - Xbox Wire". news.xbox.com. Retrieved 26 June 2018. ^ Soper, Taylor (19 September 2017). "Microsoft to accelerate growth in gaming as Xbox leader Phil Spencer joins senior leadership team". GeekWire. GeekWire, LLC. ^ a b "Phil Spencer". Xbox.com. Archived from the original on 2016-06-21. Retrieved 2014-04-06. ^ a b "Kinect Accelerator Mentor: Phil Spencer". Microsoft. Retrieved 2014-04-06. ^ a b "Welcome Phil Spencer, Microsoft's New Xbox-Everything Honcho". Time. 2014-03-31. Retrieved 2014-04-06. ^ "E3 2010: Phil Spencer interview". The Telegraph. 2010-07-15. Retrieved 2014-04-06. ^ "Phil Spencer E3 2011 Interview". G4tv. 2011-06-07. Retrieved 2014-04-06. ^ "E3 2012: Phil Spencer Post-Conference Interview". 2012-06-05. Retrieved 2014-04-06. ^ "E3 2013: Phil Spencer Talks Xbox One Lineup". GameTrailers. 2013-06-10. Retrieved 2014-04-06. ^ "Satya Nadella email to employees on tuning our organization". Microsoft. 2014-03-31. Retrieved 2014-04-06. ^ Weinberger, Matt. "Microsoft Xbox boss Phil Spencer just got a big promotion, and will now report directly to CEO Satya Nadella". businessinsider.com. Retrieved 19 September 2017. ^ Takahashi, Dean (February 23, 2018). "The DeanBeat: Microsoft's Phil Spencer steps up as a diversity leader". VentureBeat. Retrieved 3 July 2018.